More than 400 people from 21 countries and regions around the world came to Taichung in central Taiwan to take part in 2015 Overseas Tzu Chi Commissioners and Tzu Cheng Faith Corps Certification Training Camp for overseas volunteers. They included members from Europe, Asia, Africa, the Americas and the Oceania; there was also a delegation of three from Šamac in Bosnia-Herzegovina who came to Taiwan to thank Master Cheng Yen in person for the foundation’s help after serious floods hit the city in 2014. The delegation from Šamac included Mr. Predrag Marinkovic, speaker of the Assembly of the Municipality, accompanied by City Councilor Mr. Marijan Misic and translator Mr. Joco Mijanic. They made a journey of 15 hours in order to see the Master and express their deep gratitude. Tzu Chi's link with Bosnia started at the end of May 2014 when the Balkan peninsula was devastated by torrential rain that caused widespread damage. Worst hit were Bosnia, Serbia and Croatia. At the request of the Bosnian government, Tzu Chi volunteers in Munich, Germany twice visited the country to carry out surveys. Then they assembled a team of 50 volunteers from Germany, Britain, France, Ireland, Italy, Austria, Malaysia and Taiwan; they set out from Germany and made a journey of more than 800 kilometers and crossed four countries. Because they came from many countries, this attracted the suspicion of the customs and they were subject to rigorous inspections before being allowed to proceed. 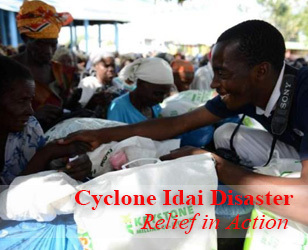 They provided long-term help in money and relief materials to 600 families in the affected areas. In addition, volunteers from Germany brought a certificate from the government of Italy bestowing on Tzu Chi "the honorary citizenship of Finale Emilia", in thanks for its relief work after a series of earthquakes in 2012. The foundation is the only overseas charity to have received such an honor. Between May 20 and 29, 2012, Italy was struck by earthquakes registering 6.0 and 5.8; many homes and properties were demolished. Volunteers from Britain, Germany, France, Holland and Austria went to the affected areas in December that year to give relief goods coupons and subsidies for students; they enabled the victims to buy goods during the bitter winter and children to resume their studies with their hearts at ease. The Italian government acknowledged the long-term and continuous concern of Tzu Chi and awarded this honorary citizenship to the foundation, to praise the volunteers led by Master Cheng Yen for their help to the victims in Italy. The library of Finale Emilia has set up a bookcase dedicated to the works of Master Cheng Yen, with a photograph of her. In the camp, there were volunteers came from five countries in Africa – Mozambique, Zimbabwe, Lesotho, South Africa and Swaziland. They shared their experience in the journey of thousands of kilometers across the continent. The group of volunteers from Africa has overcome many obstacles to spread the message of goodness in different countries. Over the last four years, the volunteers from South Africa have visited five countries in Africa, covering a total of more than 15,000 kilometers, equivalent to going half around the world. 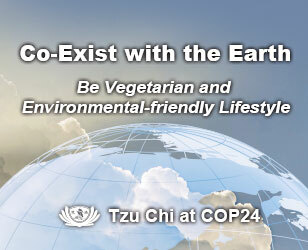 They have worked to care for AIDS patients and promoted vegetarianism and protecting the environment, showing the example themselves. They came from different countries in Africa and faced many difficulties in their own families; their example moved the foundation in Taiwan, to invite them to join the meeting. 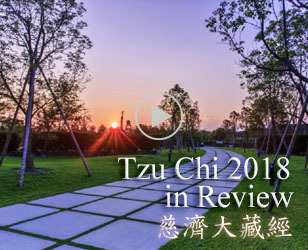 They made a journey over more than 10,000 kilometers to reach Taiwan and received the blessing of Master Cheng Yen, to become officially Tzu Chi volunteers. Paula Malendze, a newly certified Tzu Chi volunteer from Mozambique, and her 85-year-old husband were once living a wealth life. He was a wealthy Indian businessman who had a shipping company, many properties and an enormous fortune. But a civil war that lasted several decades prevented him continuing his business; his children divided up his fortune, his previous wife left him and he then became a beggar on the street. He relied on the charity of his fellow Muslims for his daily needs. In November 2011, a neighbor Gloria invited Paula to come to a meeting of volunteers in a church in Maxaquene. There volunteer Cai Dai-lin was broadcasting "Forgiveness", part of the "Essence of the Bodhi Mind". This message of Great Love touched the heart of Paula and awoke this spirit in her. She persuaded her husband to forgive everyone and not fight his former wife and children any more. Taking care of others opened Paula's heart and made her see the suffering of others. Before, her mind was closed and she had no hope; now she can bravely face the world with a positive spirit. Now there are 7,100 local volunteers in South Africa. They take care of 1,500 seriously ill people, provide food at 203 sites and feed 10,000 orphans. In Swaziland, there are 1,000 local volunteers; they look after 300 seriously ill people and have set up 50 venues to provide food and provide long-term care to 1,500 orphans.